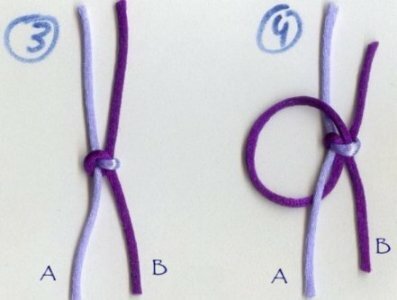 This knot must be tied with two cord ends. In these diagrams, the stationary ends of the cords are at the top. 1. With cord B , make a loop around cord A , going under and then around over the top and down. 2. Loop cord A around cord B , and bring it down under itself, through the cord B loop. 4. 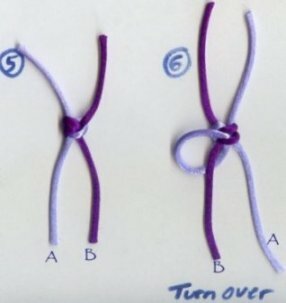 Bring cord B under cord A , around the top of the knot, and through the cord A loop. You will have to loosen the cord A loop slightly. 5. Tighten the cord B loop. 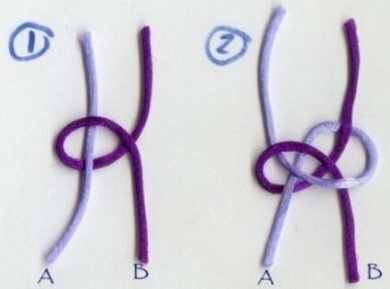 You will now have two loops from cord B going into the knot. 6. Turn your work over so that cord A is now on the right. Bring cord A under cord B , around and down through the second cord B loop. 8. Continue turning your work over and bringing the cord on the right under the cord on the left, around and down through the bottom loop. 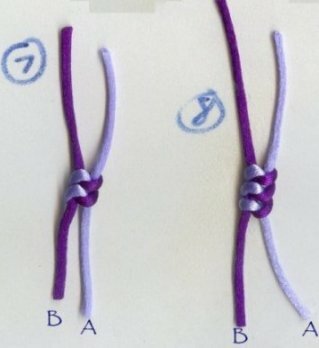 To finish, glue or singe the end, thread the cords one at a time onto a needle with a large eye and weave it into the center of the knots.